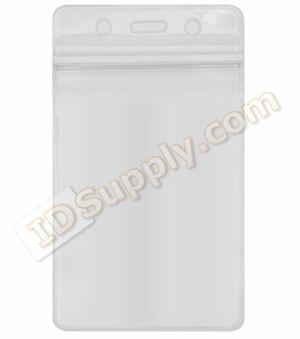 HZC80-V Vertical Clear Zip-Loc Badge Holder. Credit Card/IBM Data Card Size vinyl badge holder with slot and chain holes. Features a clear zip-loc seal to prevent dirt and moisture from ruining the card. Perfect for dirty jobs and helps prevent wear and tear on the card. Max Insert: 2-5/8" x 3-7/8"